Using the handloaded Hornady 110-grain V-Max bullets, the Custom CZ Model 527 produced excellent accuracy at 100 yards. The long-rumored .270 military cartridge is fact. Here's how it performs in the field. If you're thinking, "Just what we need, another cartridge," I probably would have said the same thing not long ago, but Remington's new 6.8mm SPC (Special Purpose Cartridge) is a different story for several reasons. Having been fortunate to be one of the few in the loop during the development of the round during the past two years, I know more about it than some. I've been able to not only study the 6.8mm as a military cartridge but also test it in several M16 variants. The 6.8x43mm SPC was conceived by a U.S. Special Operations soldier in a quest to improve the terminal ballistics of the M4 Carbine. The U.S. Army Marksmanship Unit and others assisted the Spec Ops team heading the project. Although the main objective was increased lethality, the new cartridge would go far beyond that in terms of accuracy and performance. After selecting the .30 Remington as the parent case--a decision that required only slight modification to the M16's bolt face--the case was shortened, given a new shoulder and blown out to maximum capacity for a new high-performance propellant. After testing a variety of bullets in 5.56mm, 6mm, 6.5mm, 7mm and 7.62mm, a bullet of 6.8mm was selected. This .270-caliber, 115-grain projectile has a ballistic coefficient of .350, offering optimum lethality and range. Remington began to develop the 6.8x43 back in 2002 and is officially introducing it this year as the 6.8mm Rem SPC. As this is written, the cartridge has not been released to the public, but I can tell you that it provides one MOA accuracy out to more than 600 meters. It has a flight path almost identical to that of the .308 Winchester, less chamber pressure than the .223 and fits into the M16 magazine envelope. Tests in 10 percent ballistic gelatin show incapacitation as good or better than the .308. While testing the military versions of the 6.8mm Rem SPC, I was offered the chance to hunt with a custom bolt-action rifle converted to fire the new round. I readily agreed and received the rifle along with 50 rounds of ammo loaded with Hornady 110-grain V-Max bullets. 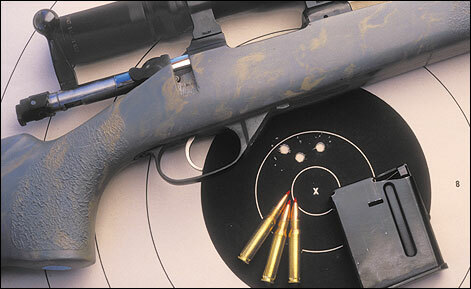 Having begun life as a CZ Model 527 in 7.62x39mm, the only portion of the rifle retained was the action. After the barrel was replaced by a stainless, semiheavy 22-inch match barrel by Mike Rock of Rock Creek Barrels, the bolt was modified to feed and eject the 6.8mm. No modification of the magazine was necessary. The high-quality, Mauser-type, .223-length CZ 527 action will accommodate rounds similar to the 6.8mm Rem SPC. With a nonrotating extractor, the action provides controlled feed with a detachable magazine of single-column design that doesn't release the round until it is partially chambered. The CZ has a totally positive thumb safety with integral scope bases. Like most true Mauser actions, it is very smooth and has an excellent adjustable trigger. A custom stock was ordered for the CZ from McMillan Fiberglass Stocks. It was handmade with a special camouflage pattern by the late Mike Barber of McMillan, just before his tragic death in a sky diving accident while making a movie. Although there is very little recoil from the 6.8mm Rem SPC, the stock was fitted with a Pachmayr Decelerator Pad to provide a nonslip surface. The rifle had no optics or iron sights, so I ordered a set of Talley one-inch steel rings. These rings are of the highest quality, and the fit is perfect. In these rings I mounted a Burris 3-9x32mm Mini scope--an ideal size for my needs. After bore-sighting the CZ, I fired it from the bench. Loads using 110-grain Hornady V-Max bullets produced a three-shot, 100-yard group of .94 inch with an average of 1.18 inches. All groups centered about 1.5 inches high and left of point of aim and averaged 2,971 fps on my Competition Electronics ProChrono LE. Because of my limited supply of ammunition and the fact that there was a 20-mph gusting wind from the right, I called it good. Opening day found my wife, Nancy, and I hunting north of Ridgway, Colorado, at about 8,000 feet where my friends had seen some big bucks the day before along with a herd of about 75 elk. We saw several nice bucks the first couple of days, but they were too far away, and the elk we spotted were even farther. I knew I would probably have to use my .300 Win. Mag. for elk, but I was determined to get a mule deer with the 6.8mm. On the third day, I was glassing a field at midday when my partner, Jaysen Evans, saw a buck running. I turned and got the deer's east end in my scope as he headed west and disappeared into some scrub oak. I signaled Jaysen to go in wide and right while I stalked the buck. After I had gone about 25 yards, I saw it trotting away, but as mule deer often do, he stopped at about 75 yards and turned to look back at me through the scrub oak. I knelt and put my crosshairs on his ribs, but some brush was between us. I moved up until the reticle was clear, and I pressed the trigger. As the shot cracked, the light recoil from the 6.8mm allowed me to see the buck do a backward summersault. He never got up. Jaysen and I estimated the deer at more than 200 pounds. What was left of the 110-grain .270 Hornady bullet had exited the opposite side of the rib cage, creating a large laceration. Both lungs had severe damage, and bullet and bone fragments had also damaged other organs. It was as clean a kill as I have ever made. In addition to any role the 6.8mm Rem SPC will have as a military cartridge, I predict it will be extremely popular as a hunting cartridge for small- to medium-size game at ranges out to 300 yards or more as it is extremely flat-shooting. Remington is now producing the 6.8mm SPC in three loadings, all with 115-grain bullets. The MatchKing Ballistic Tip Hollowpoint will deliver 2,800 fps and 2,002 ft-lbs of energy. It will also be offered in a standard BTHP loading and in an FMJ version, both with the same muzzle velocity out of a 24-inch barrel. Remington is expected to introduce rifles for the 6.8mm SPC soon, but at press time no specifics were available. One rumor is that a heavy-barrel tactical rifle will be introduced and possibly a Model Seven. Other makers are waiting anxiously to chamber AR-type rifles and carbines, and several ammunition companies plan to load the new round. Look for more news soon in the pages of RifleShooter.